Cognition refers to how a person processes and uses information. Cognitive impairment means a person has trouble remembering, learning new things, concentrating, or making decisions. It can range from mild to serious, and often happens after a stroke or brain injury, or with dementia. 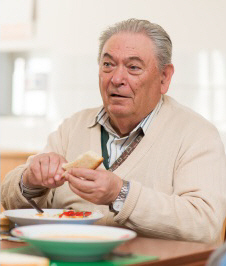 If you are caring for someone who has cognitive impairment, the following strategies might help to make meal times easier. If swallowing problems are caused by something other than cognitive impairment, see Safe eating and drinking. How do I help someone eat and drink safely? Offer meals at regular times of day. They may find it easier with five to six small meals rather than three larger ones.Allow the person to eat when they are hungry. Try to prepare familiar foods in familiar ways, especially their favourite foods. Set up the table so they are looking at someone else eating, as this may remind them to eat and swallow. you remind them to follow any guidelines given by the speech language therapist. If the person you are helping holds food in their mouth for too long, try serving foods that are sweet, sour or spicy, or that are hot or cold as this will prompt them to swallow (but be careful with hot food). If they are eating too quickly, remind them to slow down and offer smaller cutlery, such as a teaspoon, to reduce the size of each mouthful. How do I feed someone safely? If you need to feed the person, first follow the advice above. make sure their mouth is clear and clean after meals. You may need to clean their teeth and mouth. There are many different strategies to make eating and drinking safer. Please talk to your speech-language therapist if you have any questions or concerns. Written by community speech-language therapists. Adapted by HealthInfo clinical advisers. Last reviewed September 2016.